Though I’ve written dozens of book and album reviews, I’m certain I’ve never reviewed a library before. The Marion E. Wade Center, however, is not just another library. 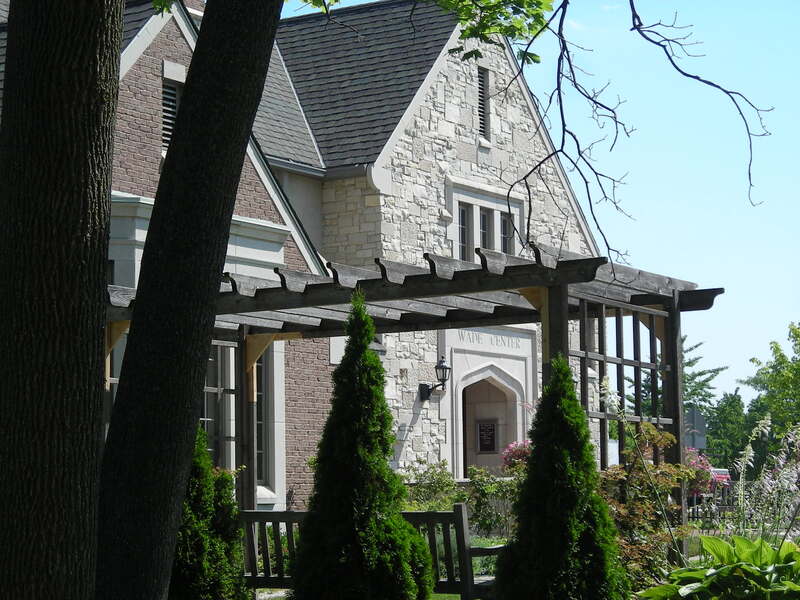 Housed at Wheaton College in the Southwest suburbs of Chicago, The Wade is the North American collection for seven key British authors of the late 19th and early 20th centuries, namely C.S. Lewis, Owen Barfield, J.R.R. Tolkien, G.K. Chesterton, George MacDonald, Dorothy L. Sayers, and Charles Williams. 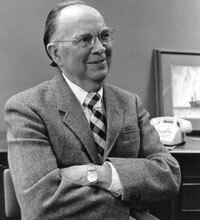 Carefully gathering archival, primary and secondary source materials for nearly forty years under the Wade endowment, the Center grew out of the literary collection of Dr. Clyde S. Kilby, a C.S. Lewis correspondent and Wheaton English professor. Beginning with C.S. Lewis, the collection grew to include authoritative acquisitions of his influences (MacDonald and Chesterton) and his friends (Tolkien, Barfield, Sayers, and Williams)–historical and honourary members of the Inklings, an influential Oxford writing group around the WWII era. Visiting the Wade was, for me, a kind of literary pilgrimage, and it did not disappoint. After experiencing a downtown Chicago poetry slam and the touching hospitality of a Wheaton family willing to house a wandering scholar, I drove through the quiet, tree-lined streets leading to the Wheaton campus. The distinctively American architecture set the street names–Lincoln, Roosevelt, Washington, Madison, and Jefferson–in striking historical context. So imagine my surprise as I find in this olde American mainstreet community an absolutely perfect English cottage of brick, slate, and sandstone. Walking past a Narnian lamppost through a well-kept flower garden, I approached the large wooden doors and was struck with the idea I was walking up to the central library of Hobbiton. Inside this literary mecca are handwritten notes from Lewis to Tolkien about their work, snatches of handwritten poetry by Williams and Barfield, manuscripts of Sayers’ famous mystery novels, and scores of resources for reading the witty and influential Chesterton and MacDonald. The architects picked the perfect structure to capture the nostalgia we fans have for the Oxford Brits we like to read so much. Inside the large wooden doors, however, it was all business. It was still lovely, of course. Both the museum and the Clyde Kilby reading room are decorated with deep wooden hues, rich mahogany and cherry, and thick, plush, royal green carpets–all designed to bring a hushed tone to the experience. I was greeted by name when I entered–as if I was some distinguished guest instead of an unknown academic from rural Canada–which only heightened my (hopefully) well-hidden anxiety. As I moved into the reading room, archivist Laura Schmidt put me at ease. She gave me a tour of the C.S. 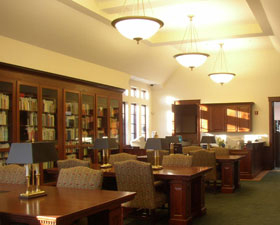 Lewis collection, which included all of the Lewis letters they can find, binders of correspondence, nearly all editions of all of his work, original typed or handwritten manuscripts of much of his writing, a large portion of his original personal library, and hundreds of theses, dissertations, books, and journals dedicated to Lewis and his contemporaries. The organization is meticulous–Laura’s understanding of and adherence to the Wade rules was complete and unwavering–and the Wade team are constantly updating access to the collection. The bulk of resources is dizzying–there were literally hundreds of articles categorized by name that I didn’t even have time to approach–yet the entire team worked quietly toward the completion of an unending job. Once introduced to my resources, I was given a large wooden table with bankers light and comfortable chair to do my work. The reading room is a spacious, well-lit wing of the Wade, walled with glassed-in bookshelves. At the south end there is an atrium with lounging chairs, though I never had a chance to lounge. I had only three days–just over twenty hours by the time I was settled–to do my work. I began by reading through C.S. Lewis’ original King James Bible, looking at his notations and cataloging the things he underlined. The Bible was a century old when he began using it, so it was brought to me on a “book pillow,” and made for a morning of pleasant reading. I found some intriguing notations, though none of Lewis’ other Bibles had much: the Greek bibles had some margin translations in faded pencil, and an English one had a reordering of the canonical books in a puzzle I have not solved. The afternoon of the first day and the morning of the second was spent in secondary sources–not an exciting task, but important as I prepare to launch a PhD. I leafed through four binders of thesis titles, but only a handful were directly relevant to my work. Going through these titles, as well as various C.S. Lewis Society journals, told me more about C.S. Lewis studies than it actually did about Lewis himself, but that was fine with me. I’ve discovered that the questions I’m asking are largely not covered. So I’m either on the right track to original work, or else I’m on the wrong path altogether. I saved my work on The Screwtape Letters manuscripts for the afternoon of the second day, a kind of delayed pleasure. And it really was a pleasure. 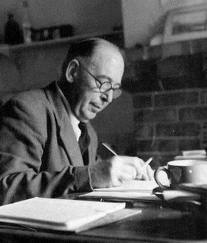 For the next day and a half, I worked in original material on Screwtape, some of Lewis’ correspondence, and three of Lewis’ poems. To my great astonishment, I found things that re-oriented my entire Lewis research project. It was a risk for me to go to the Wade this early in my work, but the risk really paid off. I won’t give you the virtual tour–you need to discover this place for yourself. One of the things that struck me, though, was the astounding generousity of spirit in the place. I got to know Laura the most, who was always kind, supportive, and an unending source of information–my discoveries did not surprise her in the least. But everyone was so helpful and encouraging. Marjorie Lamp Mead, the associate director of the Wade Center, even took the time to interview me on my project and worked to find resources to help me on my journey. I went into her office for a five minute visit and emerged an hour later, lost in her time warp of Lewis conversation. My suspicion is that she is a people collector, and she spun my ideas into entirely new areas. Apart from the staff, the setting itself is so very interesting. Visitors pop in from time to time, walking through the shelves of books and museum exhibits with wide-eyed wonder. Local fans come to sit in the sun and read their favourite authors. A man showed up from the 1920s in a trim-white suit and a tight-woven sun hat to inquire of a work. A sundress-wearing twenty-something danced in and out of the collection, clearly more well-versed in her field than I am in mine. A visiting Cambridge theologian took a moment to chat with me on the front lawn as I ate my lunch, and Wheaton scholars–often key figures in the seven authors–moved among the tables. I had the opportunity to share my table with a poet doing important work on Charles Williams, and I had the chance to explain to a grade seven class my research project. They didn’t seem as impressed as I was. Overall, the entire three days, coupled with the C.S. Lewis and Inklings Colloquium the weekend before, was one of the most intellectually stimulating weeks of my life. My mind is still full, congested with experiences and ideas, and I am spending this week trying to pull the ideas out and put them into some reasonable form. I am, alas, a thirty hour drive from this amazing resource. But if you have any interest or ability to get to Chicago, I highly recommend a visit to the Wade. For me, it was a sublime experience. This entry was posted in Reviews and tagged archive, books, C.S. Lewis, Charles Williams, Chicago, George MacDonald, library, literature, Marion E. Wade Center, The Screwtape Letters, Tolkien, Wheaton College. Bookmark the permalink. About 1955-57, (ages 9 to 11), I wrote a child’s fan letter to C.S. Lewis, (c/o Macmillans) and was excited to receive a reply. I wrote back and we exchanged a few letters. At that time I had no idea about how famous Mr. Lewis was, or would become, and we saved the letters for a few years but eventually my mother threw them out. Now I am curious to see whether they may have survived in an archive. Is there any way to tell if they still exist ? Thank you! That’s very cool that you wrote and got letters back! I have read through all his letters and quite enjoyed the children’s responses. 1. Write to Macmillan and ask if they have an archival index. I don’t know if someone has worked through the publishers to find files. 2. 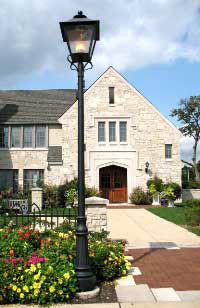 The Marion Wade Centre at Wheaton College has a lot of materials and are well indexed. You could ask them.